Be the first to share your favorite memory, photo or story of Aubery "Tex". This memorial page is dedicated for family, friends and future generations to celebrate the life of their loved one. Aubrey “Tex” George Nauert, 78, husband of Gwen Freeman Nauert, died Friday, January 25, 2019, peacefully at his residence. Mr. Nauert was born December 27, 1940, in Austin, TX, a son of the late George W. Nauert and Elizabeth Helen Helge Nauert. He grew up in Austin, graduated from Manor High School, and attended United Concordia College. He continued his education while serving in the US Navy. 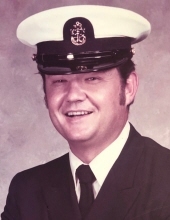 Mr. Nauert served five tours of duty in the Republic of Viet Nam and retired from the US Navy after twenty-three years of service. He was a member of Harpers Lodge #225, Ancient Free Masons. Mr. Nauert volunteered for several years for Habitat For Humanity and always helped anyone in need. He was a great “Story Teller” and shared his life’s many experiences. Mr. Nauert had a passion for travel and seeing the world, as he looked for God’s beauty and places to bass fish. He was a loving husband, father and grand-father and will surely be missed by all. In addition to his parents, Mr. Nauert is predeceased by: his first wife, Hilda Jane Powell Nauert; and a brother, William “Billy” Nauert. Surviving, in addition to his wife of Andrews, are: a son, Anthony Keith Nauert (Angelique) of Henderson, LA; a daughter, Jennifer Marie Nauert Gregory of Cartersville, GA; four grandchildren, Amber Marie and Andru Kai Neuert, Lindsay Wheeler, and Lance Gregory; four great-grandchildren, Katlynn, Cheyenne, Ashlynn and Brison; a sister, Catherine Montgomery of Houston, TX; three brothers, Alto Nauert (Janet) of Manor, TX, Wesley Nauert (Carol) of Pflugerville, TA and Gilford Nauert of Virginia Beach, VA; two special great-nieces and nephews, Alexis and Evan, a brother-in-law, Ronnie Powell; two sisters-in-law, Doris Marlowe and Bertha Brannan; and many nieces and nephews. Funeral Services will be twelve noon, Monday, January 28, 2019, in Pine Crest Baptist Church. Officiating will be the Rev. Jack Mobley. The family will receive friends prior to the service Monday in the Church Sanctuary from ten until twelve o’clock. Burial will follow in Bethel United Methodist Cemetery. To send flowers or a remembrance gift to the family of Aubery "Tex" George Nauert, please visit our Tribute Store. "Email Address" would like to share the life celebration of Aubery "Tex" George Nauert. Click on the "link" to go to share a favorite memory or leave a condolence message for the family.